Though he rarely stood out as a league-leader in any pitching category, Hall of Famer Eddie Plank compiled a legendary career through longevity and consistency. In his 17 seasons, Plank topped the 20-win mark eight times while posting at least 14 victories each season until his last, where he still managed a 1.79 ERA at 41 years old. When he hung up his spikes, Plank had 326 wins, the most by any lefthander until Warren Spahn came along. Whether it was Walter Johnson, Christy Mathewson or another pitcher having a standout year like Jack Chesbro or Ed Walsh, Eddie Plank always seemed to be second best year after year. 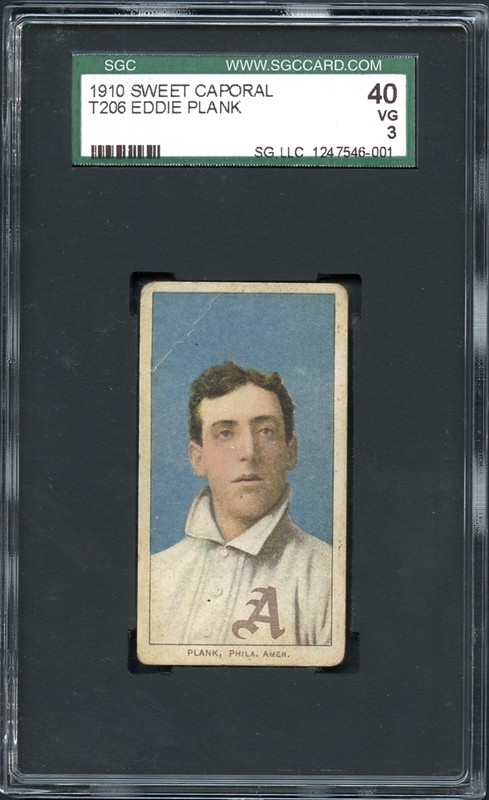 But here's a situation where being second best is still very impressive as this T206 card of Plank trails only the legendary Honus Wagner as the most coveted card in the iconic T206 series. Experts estimate that only about 100 Plank examples exist, compared to the approximately 65 or so Honus Wagner cards that continue to make headlines with their seven-figure sales records. Like the Wagner card, there are theories as to why the Plank card is so scarce relative to the rest of the series but none have proven conclusive and in fact, most have been rejected. One such explanation is that the printing plate for the Plank card was broken in early production though it's unlikely since the card exists with both the 150 series and 350 series reverse. Even if one of the printing plates did indeed break, the Plank card would be just as numerous as any other card from the other plate, which is not the case. Another rationale is that Plank, like Wagner, had the card pulled from production because he did not want his name used to endorse tobacco products. 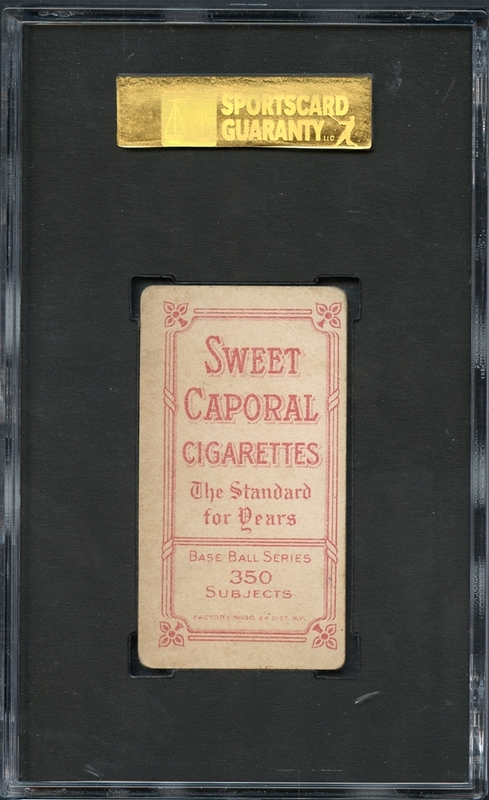 Although he is prominently featured in virtually all of the candy card sets from that time period, his absence from the T3, T201, T202, T205 and T207 tobacco issues supports this theory, though he does appear in the T204 Ramly and T5 Pinkerton sets. The answer to that question will likely never be known but the T206 Eddie Plank card joins the T206 Wagner and 1933 Goudey Lajoie as the most recognized cards of the early 20th century. The featured rarity is graded SGC 40 VG 3 and unlike most known examples, exhibits virtually perfect centering. While the rounded corners are commensurate with the grade, their consistency does little to take away from the overall allure. The iconic image of the Philadelphia hurler is well-presented and very sharp with a bold blue backdrop that is not influenced by a light crease in the upper left corner, another pleasant surprise as virtually all examples with the more difficult "350 subjects" reverse are slightly blurred or out of focus. 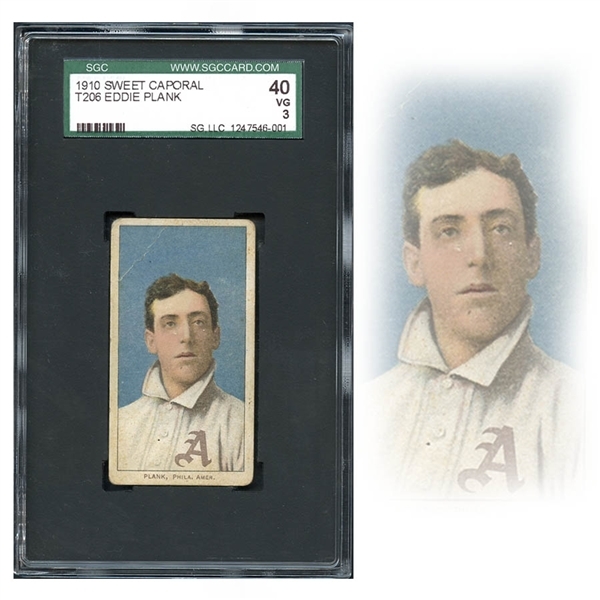 You can go all throughout history from the very first baseball cards of the mid-1800s to today and only a handful can be considered a "significant event" when they come available at auction. The T206 Plank card is certainly near the top of that list.